Yay! I finally finished the socks in Colinette JitterBug Merino, purple passion. My youngest daughter loves them, and even though it is Summer here, she is wearing them! 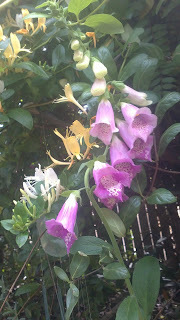 These foxgloves self-seeded into a pot! How lucky is that? I'm still loving the garden, although we've had a few really hot days and some flowers are looking a bit limp -I think it will rain today though. I'm off to a new knitting group this week at Spinners. I need to start a new project. I am still going on the Madli. I am thinking maybe a Nancy Bush pair of socks? Gorgeous socks! Love the colour. We had a bit of a heat wave too last week and strangely only one plant seemed to wilt. The rest so far are doing well. Its much cooler now though. what's not to love in this post? Purple socks and flowers, and self seeded fox gloves! I've never grown foxgloves. For some reason they seem so romantic to me, I must!